When we think of battery operated backup sump pumps, we think of storms that knock off power and kill the main pump. However, every year, a lot of basements flood without a power outage. Sump pump failure, a glitch in the pump switch, a tripped circuit breaker or even someone accidentally unplugging the pump are things that happen more often than you think. I just read a blog from someone who had his basement under water because he had unplugged the pump for a while to plug in a power tool, and when he was done with the tool he completely forgot to plug it back in. 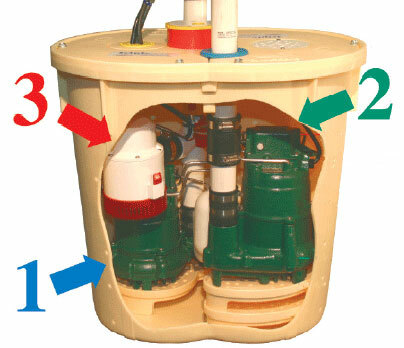 A battery operated backup sump pump system such as the Basement SystemâÂÂs UltraSump is vital to keep your basement from flooding whenever the main pump is out of commission, for any reason. This powerful, high capacity DC battery operated pump system is capable of pumping 11.000 gallons with the power stored in a fully charged battery, and comes with an alarm that will let you know when the main pump stops and the backup kicks in. UltraSump is part of the innovative TripleSafe system, the only system in the industry guaranteed to reduce the chances of a basement flood to statistical insignificance. Contact us for a free estimate and see how affordable it is to have your basement fully protected.